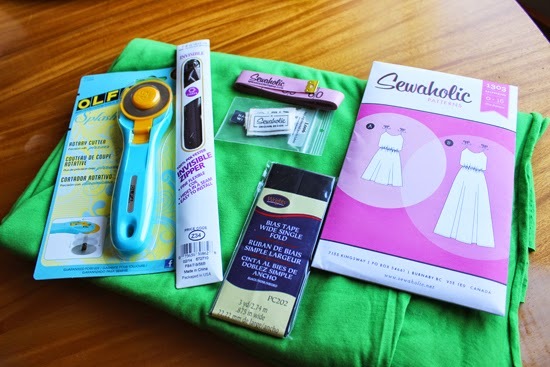 When I first starting reading sewing blogs back in 2011 Sewaholic was one of the first ones I followed. I was drawn to the clear tutorials, wonderful instructions, and cute patterns. 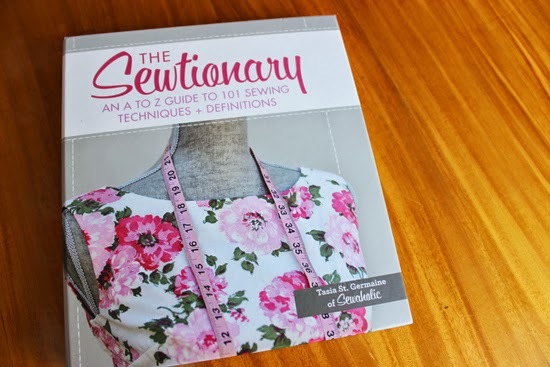 Today, I still read the blog for the same reasons, so when Tasia announced that she was releasing a book, The Sewtionary: An A to Z Guide to 101 Sewing Techniques and Definitions , compiled with all of the tips I had grown to know and love, the book was in my Amazon shopping cart within minutes. I thought I would share my thoughts first and then end this post with a giveaway. Sound good? Physically this is my ideal sewing book (is that weird to say? hahaha). It's hardcover, sturdy, and has a spiral ring to hold all the pages. Spiral ring books are so great when learning a new technique! The pages stay put and don't need to be propped open while sewing. The matte paper is also a plus because you don't have to experience that annoying glare that happens with late night sewing and a lamp as a light source. The book is also photo heavy which is a must for a visual reader like me. Beginners: are you too shy to ask how to sew on a button? Need to learn how to take your measurements? What about ease, what is that exactly? Tasia has you covered and this book will help grow your sewing skills. Making bias tape, French seams, and different zipper installations are also mentioned in the book and are good reminders for me because they're not things I do with every sewing project and sometimes need a quick refresher. There are also techniques which were unexpected and are new to me. Shoulder pads, French tacks, and godets have not been part of any of my sewing projects, but who is to say they won't in the future? I'm confident that when/if I need to tackle these (new to me) challenges the Sewtionary will be here to save the day. Instant help for the win! Tasia is so sweet and sent a pattern of my choice for one of you as a giveaway gift, so I chose Saltspring, one of my favorites. She also threw in a Sewaholic tape measure and the cutest tags ever! I'm adding bias tape, an invisible zipper, two yards of a green Girl Charlee knit fabric, and a rotary cutter. ***Please note that the book is not included in this bundle*** If you would like a chance to win all the treasures in the photo above then please leave a comment. It's really important to leave an e-mail address or blog address. Without that info there is no way of contacting the winner. Giveaway will end two weeks from today on Thursday, September 25th. Do you want to purchase the book? You can get it here on Amazon or from the Sewaholic site directly. If you order it from Sewaholic Tasia will even sign it for you. Check out the other blogs on the tour for more info on the book and chances to win other prizes! The book looks beautiful, and that is an excellent giveaway. I, too, love the spiral ring format. It is much better than having your book close in the middle of what you are doing! I can be reached via my blog, Famhousegarden.blospot.com . What a great giveaway - I have been eyeing Saltspring for a while. I will definitely be getting that book! My mother taught me some sewing basics but the rest I've kind of made up on my own. Having a good reference book is essential to my progress as a sewer. So glad you reviewed it. That green fabric is a fabulous color too! Can't wait to pick this book up! And what a great giveaway! wow this book looks amazing and a must have. as someone who is trying to learn new techniques it is always handy to have a book to hand that can provide you with an answer when there is no-one else available. Can't wait to get the book! Wonderful giveaway!! Maybe this is what I need to get back in the groove? My sewing machine has been idle for a good 3 months now! Tasia is so smart and her blog is excellent. I am not surprised that the book great! I am a loyal to my TNT, the Renfrew. Count me in! I've already got the book & I agree that it's fantastic, but I'd love to win! I've been planning on giving a dear sewing friend a copy of the book for Christmas, but the rest of the goodies, I'd keep for myself! I'm shmcpa at yahoo. I have been eyeing this pattern for ages and would love to make one up! I can be reached at veganvixen08 at gmail. I don't own any sewing books, despite having been sewing for 10 years on and off! This one would be more handy than trying to scroll through tutorials on my phone as I sew. Awesome prize pack! Thanks for the give-away and the great blog :). Great giveaway! 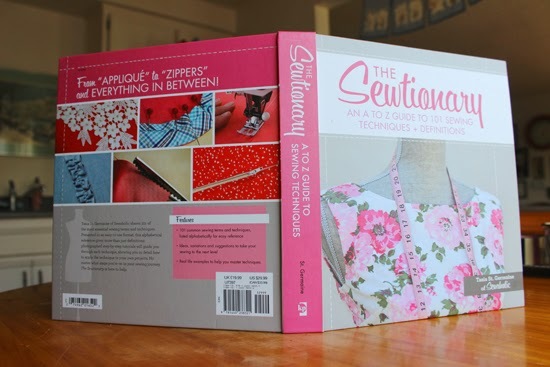 And lovely review of the Sewaholic book, it's always hard to tell if a new sewing book will be a handy reference or something that just gathers dust on a bookcase. Sounds like a great book! It's always good to have a handy reference guide around (or several) for learning new techniques. You've put a great giveaway together too - so nice. I've had my eye on that Saltspring pattern! This book sounds amazing - I think I'm going to order a signed one from Tasia. That green is very lush! I'm asking the hubby for the book for Christmas. The book is so beautiful and well designed...much like Tasia's own 'makes'. I've followed Tasia's blog from the beginning and it's been quite an adventure. The giveaway is wonderful and it would be a real treat to win it. Here I thought, book give away! Sweet! But then I saw the to-win bundle & I thought, Green! Sweet-er! Pick me! (I will totally invest in the book as well). Thanks for the good review! Count me in on this giveaway! Thanks for the review. The book looks lovely and the prize fantastic. Spiral bound instruction books are great! It sounds like a great book. I like the looks of this book too. One of the best things is the spiral binding. It's so nice to be able to leave a book open flat on your ironing board,or table, and follow the how-to. Thank-you for this giveaway. I just discovered Girl Charlie a couple of weeks ago and have some lovely new material. (all for the children..well almost all). Looks like a really good book; unfortunately my bookcase is chocka at the moment; might have to see what I have that's not worth keeping. Very neat prize, do you ship to France? I'd love to win this wonderful prize! Sewaholic is fantastic! I really-really love the book! It looks so nice and I love reading it. It's really informative and can be useful even for an experienced sewer. The bundle is truly drool-worthy. great giveaway! Oh yes, I would love to win this awesome package! I almost bought this book at Barnes & Nobles the other day. Now I think I must have it. And oooh green fabric, yes please!! I'd love to make the Saltspring in that gorgeous fabric!! What a great giveaway...count me in! Thanks for the contest! That green fabric is a great colour!!! I've finally started gathering sewing reference books so I'll have to check this out. Also, that green and that pattern look gorgeous... crossing my fingers now that I get lucky and win them. I can't wait to get a copy of this! I enjoy the Sewaholic blog and really admire Tasia's work. Thanks for the prize! Whoever wins is going to have fun with it! The book looks lovely. I plan on asking it for my upcoming birthday. I love it when sewing books are spiral bound so they stay open. It's the best thing! Wonderful bundle. Thanks for putting this together and the chance to win! Thank you for the wonderful review. I am a visual learner too. I am learning to sew by blogs, YouTube, books or anything I can get my hands. My favorite Sewaholic pattern is the Hollyburton skirt, Thank you again for the review and Giveaway! This sounds amazing. I'm just starting to learn about knits, this would be an awesome prize and so many opportunities to learn new things! Tasia's blog was also one of the first blog I followed, I also often refer to her sew-along and tutorials, I have no doubt her book is a well of info! Thanks for the bundle and the chance to win it! 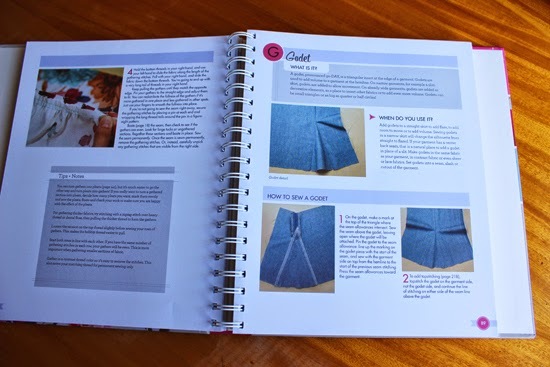 Nice review...I love Tasia's sewing patterns and think her book is such a great resource. Thanks for offering such a lovely giveaway bundle! Such a great giveaway! The more I read reviews of the book the more I want it. Good work! I would love a chance to win! The book and the bundle both look fabulous!Lalala! Looks like a fantastic book. And I love the pattern you chose -- my daughter would love this. Thanks for the giveaway. I just discovered your blog and its great! Plus, my most favorite niece and her mother are both "crazy cat ladies". I will now have to make them both something great next month! Thanks for the chance. I have always wanted an Olfa rotary cutter. That green fabric is so awesome! I love green anything - it's an addiction. Thanks for the giveaway and such an awesome prize! Such lovely prizes! I love the book too and will have to keep that in mind for a birthday gift. Thanks for offering this collection of goodies! I so need to get hold of this book. And what a great giveaway parcel you've put together. I would love to win it. Thanks for reviewing this book. I'll be looking for it in a local shop. I am really looking forward to having my own copy of Sewtionary. I know it will come in so handy as I work my way through my beginning adventure of garment sewing. I've been quilting for years, but in this last year, I've really started to try to sew for myself. Looking at that fabulous bundle of goodies you are offering, I surely would need the book to get me through to the end. Such a fabulous gift from both of you. Someone is going to be one lucky person! What a lovely bundle of treasure! I like that the book opens flat too- so useful when trying to follow instructions and do at the same time. Not only that it is good looking too so will be poured over quite a lot at my house. Thanks for a great review - it looks a fab book! Girl Charlee knit fabric is a delightful green that I could use in my stash. THe Cutest Tags ever too....I really need labels. Thank you so much for the Giveaway opportunity. Oh wow, I'd love to win this package! I was totally looking forward to this book coming out too! I'm glad to hear it's lived up to expectations. And a sewing giveaway? Hard not to get excited about that! Thanks for the giveaway and review! The book looks wonderful, covering such a wide range of techniques. I read at sewaholic that Tasia had had to condense because she had so much material. What I would give to take a peek at what she could not include! I'm so excited for this giveaway and I'm looking forward buying the book and reading it. Looks like a great book! And I've had my eye on the saltspring for a while. I'd love to make a few of those ;). That green fabric looks a little scary but fun! I could really use that book. Thanks for having the giveaway! Wow! Thanks for the great giveaway! I'm really curious about the Sewtionary, its going on my christmas wish list! Great Blog Tour and Giveaway. Just started following your blog recently and im glad i found it. Fabulous blog tour and some great tips here. Stopped by for a quick read and am still here hours later! Great revies of a great book! And a wonderful giveaway! Thank you for the opportunity! It looks like a very comprehensive and useful book. Thanks for the review and amazing giveaway! The book looks wonderful & so does your prize package! Great book. Thanks for the chance to win. The book looks great. Would love to win the bundle. Yes, the salt springs on the blogosphere are so cute. I am liking the fabric and have been wanting a rotary cutter. What a great lot of goodies! 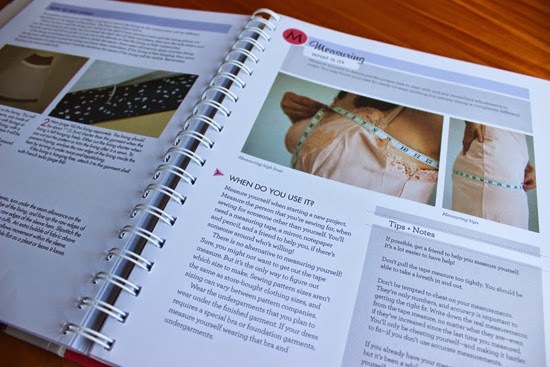 And this looks like a fabulous book even for the experienced sewists. Thanks for a chance at the give-away! what a lovely prize. I will check out the book, too!